As a proud owner of Deathwatch Overkill box I've already gave you my impressions on the base game, as well as its units and missions. However, it's just a half of the game's full potential: I was pleasantly surprised with all the expansion support Games Workshop provided for the game in White Dwarf magazine and on the Warhammer Community website. So let us examine the expanded edition of Overkill and take a look at all the new rules GW treated us with over the year the game has been out. 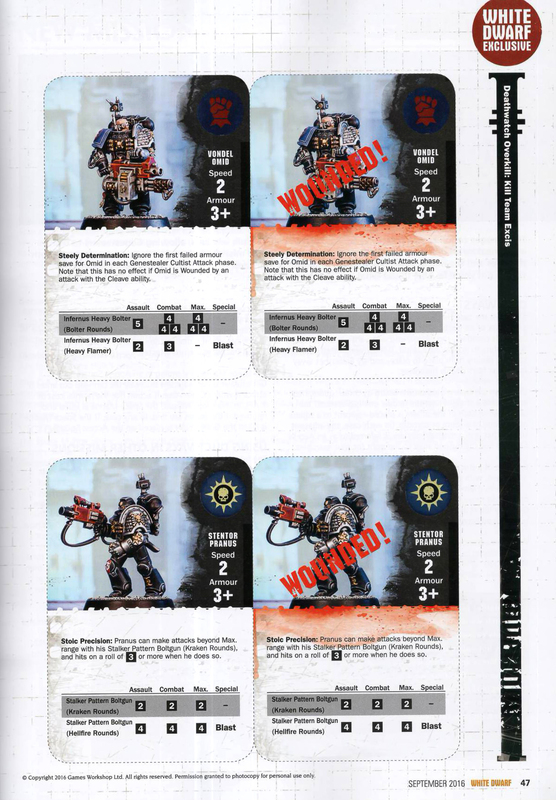 It only took Games Workshop a month to roll out a first set of new rules for Deathwatch Overkill. 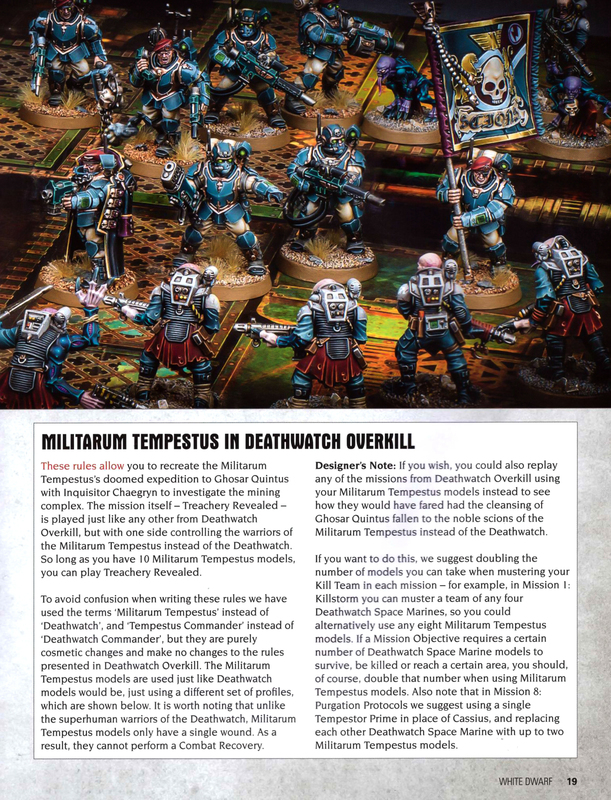 It was released in White Dwarf #114 in 2nd April 2016 under the name 'Treachery Revealed' and mostly targeted Imperial Guard players, allowing them to swap Deathwatch marines required for the game for twice as many Tempestus Scions with various weaponry. 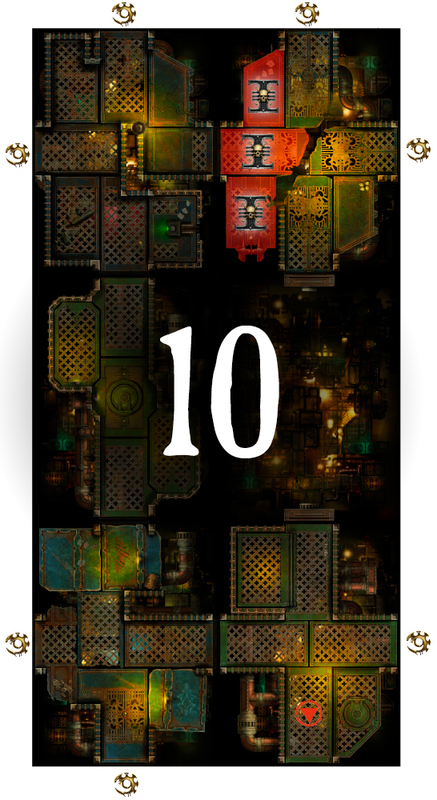 As a bonus, we also got a brand new 10th mission, which uses the tiles from the base game. Scans of White Dwarf pages dedicated to Treachery Revealed can be found here:       In November 2016 the same rules were put out for free at Warhammer Community website [here]. 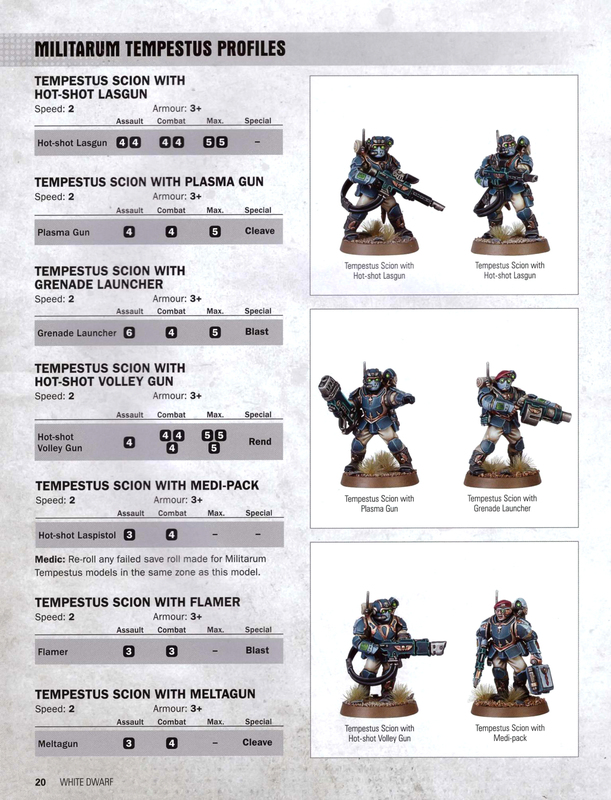 However, due to a mistake on GW's part, the rules for medic pack are missing on the website version of the rules, which makes the Scion with one rather useless. I would advise you to download the pages, no mistakes there. This is your Swiss army knife trooper, dishing out two good attacks at any distance. A couple of these guys will be useful in any mission, but specialist troopers are much more effective when used correctly. This gun is no use in assault, but once you are in combat or maximum range, it can really dish out the hurt. This is where the majority of Tempestus' firepower's at — take a bunch and don't look back. Plasma Gun only makes a single shot per phase, but its strength is in a Cleave ability the weapon has. A couple of these won't hurt, but keep in mind, that beyond the assault range, the volley gun is better even against armoured models like Aberrants, Magos and Primus. Meltagun is a little better than plasma gun in assault, but is unable to shoot at maximum range. Useless weapon, no other way to put it. Another weapon with one shot per attack phase, this time — with a Blast ability. It works nicely against groups of weaker hybrids, which are almost always present on the table, so you might as well take some. Keep in mind that the Genestealer player will try to counter it by spreading their units though. Flamer is very similar to grenade launcher. In comparison, it cannot fire at maximum range, but becomes much more dangerous at assault and combat distances. Given that most Genestealer Cult models are desperate to get close to you this is a great trade-off. If you wanted to take grenade launchers, flamer will probably serve you better. This Scion traded most of his attack potential for an ability to enhance his comrades' defenses when located in a same zone. However, to use him effectively, you'll have to put a bunch of Tempestus warriors in a single zone, which will make them very vulnerable to Blast attacks. It might be easier to just take another gunner. Vox-Caster grants the Tempestus player Suberei's ability to look at one Ambush card each turn. However, its owner is almost useless in combat, so, unless you're playing a Tempestus-only kill team, you better just throw out another Scion and just take Suberei himself, he'll be more useful overall. This guy is also not much of a fighter, but he has the same ability as Cassius, allowing all friendly models on the same board section to re-roll results of 1 when fighting in assault. However, best Tempestus units are long-ranged so this ability is of dubious use. This is the only assault specialist among the Scions. He can be equipped in a variety of ways — all three pistols have their uses, but the chainsword is a clear winner among the melee weapons. However, he doesn't fit well with overall long-ranged style of a Tempestus force so take him only if you're sure you know what to do with him. Tempestus commander only has a pistol of his choice to fight with, but he can give a single friendly model in the same zone an ability to attack for the third time. This can be useful, but most of the time you're better served by another Scion with a big gun. Made out to be a prequel for the base game's campaign, this mission tasks the Scions' player to fight his way to the exit in order to warn the inquisitor of the Cult's emergence. 10 Scions (or 5 marines, if you still prefer to play with those) deploy in the starting area and win if at least one can successfully escape through the exit. Genestealer Cult player has every unit at his disposal, although Patriarch is only added to the deck once it has been played once. Cultists win once the last Scion (or marine) is slain. This mission is not that difficult for the Scions player. He should make sure he has a suitable force to deal with every threat his squad might face, and fight towards the exit without wasting any turns. Genestealers are likely to win if they successfully manage to hold up the Scions long enough to bring the Patriarch to the field which tilts the odds heavily in their favor, as Scions don't have an easy answer for that beast of a unit. 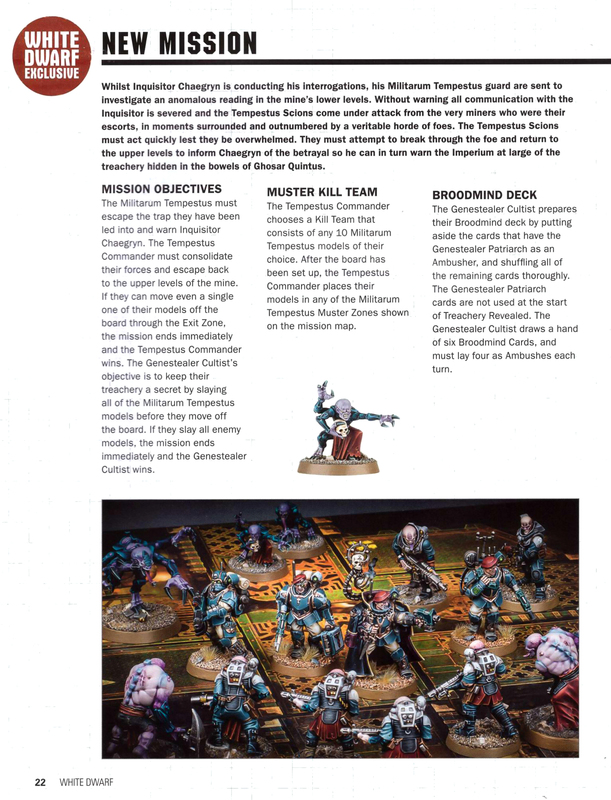 In short: Deathwatch Overkill becomes noticeably different when playing with Scions, so it can be argued that this expansion not just adds new units but gives the players an entirely new game mode. Tempestus squad is much more effective against a multitude of small threats, while the ability to take a single unit several times makes for some impressive firepower. At the same time, lack of the marines' ability to recover lost wounds makes Scions a lot more vulnerable in the long run, while most of them don't have much to offer in close combat. In the end, the added variety definitely adds a lot to the game, especially if you're willing to house rule an ability to mix and match Astartes warriors with Scions support, which can make for interesting combinations. Lore-wise, new Astartes warriors hail from a lot more unique successor chapters, which already makes them more interesting. But let's find out how the new reinforcements hold up rule-wise. Thaniel is the only Deathwatch marine in the game without any kind of attack beyond assault range, but he has two special rules that more than make up for that loss. He makes his saving throw even against Cleave attacks and stuns everything he manages to hut with his maul, denying the enemy his attacks in the next attack phase. This makes the White Consul a perfect warrior for a sparring match against Genestealers or even the Patriarch itself. Luca is a very unpredictable close combat fighter: he can slay every hybrid around in a single turn, or fail to make a single wound. Keep him near Cassius to dramatically increase the chance of the former. He can also support his brothers in long-ranged combat if need be. Shotgun-wielding Howling Griffon is an good enough warrior at combat distance, but doesn't have much in terms of interesting abilities. Cleave in assault is almost useless, and the same goes for his ability to avenge the dead: it's much better to avoid casualties in the first place, rather then try and benefit from them. Vondel is very similar to his frag canon-wielding brother from the Imperial Fists. In comparison, he trades off the ability to re-roll 1-s in attack for the ability to re-roll his first failed armour save each turn. It makes him less dangerous, but more survivable, which is a good trade-off more often than not. In addition, unlike Grytt, he is more than capable do deal out some pain is assault with his heavy flamer. Pranus definitely deserves to be called a sniper: he is an only warrior in the game with an unlimited attack distance. Unfortunately, shooting beyond maximum range is rarely useful, and in all other senses he is inferior to other Astartes long range experts. 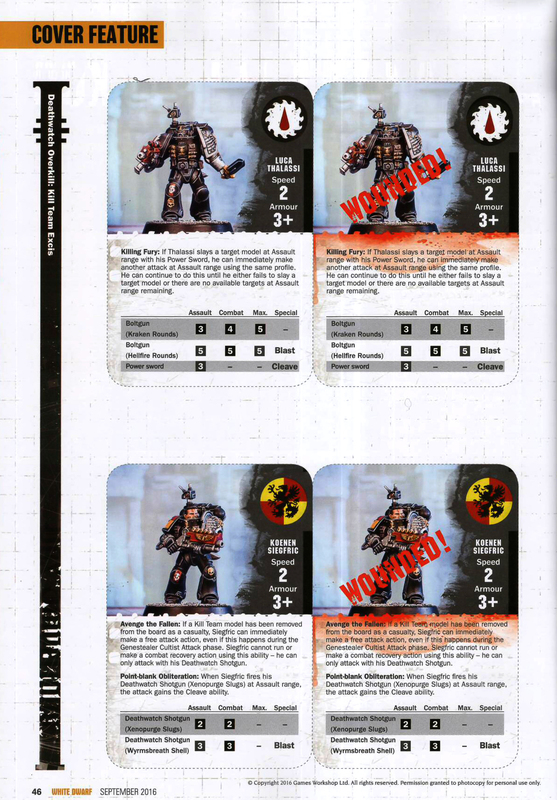 In short: New marines add a bunch of interesting options to the Deathwatch player's toolbox and feel different from the ones in the base game. The five new Astartes are neither completely useless, nor game-breaking. All of them have their uses and in a lot of missions, some of the new abilities might be just what you need to turn a defeat into victory. 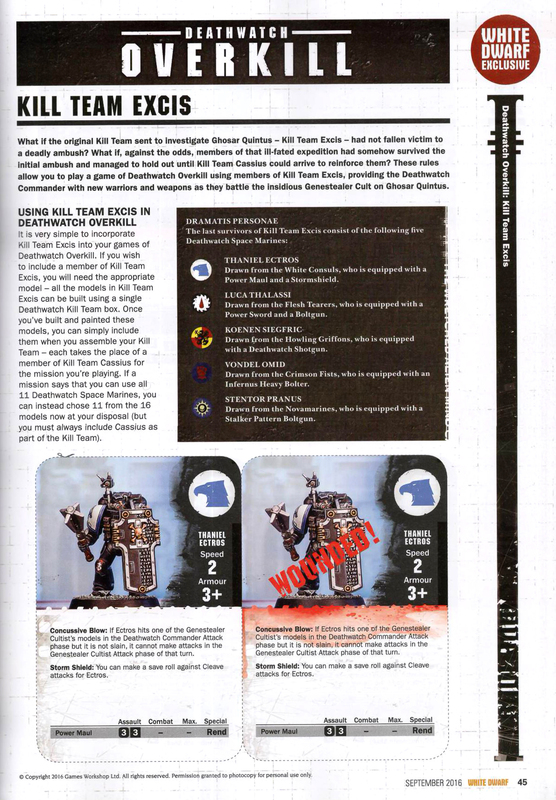 Full scale release of Genestealer Cult faction for 40k gave us a last expansion for Deathwatch Overkill. 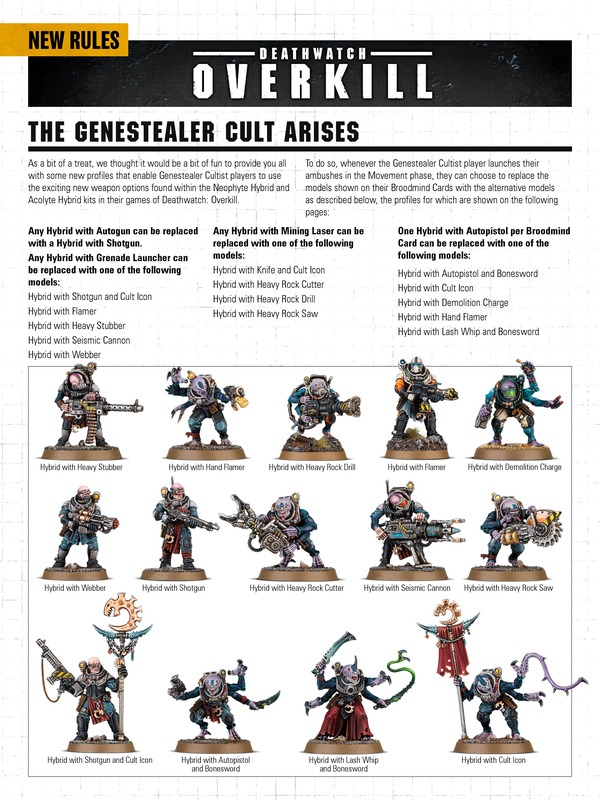 Rules published in White Dwarf in December 2016 finally treated the Genestealer Cult players, giving them an option to swap basic hybrids from the core box for a bunch of more interestingly equipped warriors made from Neophyte Hybrids and Acolyte Hybrids/Hybrid Metamorphs boxes. Here are the scans:  . A word of warning — the magazine version available online is full of mistakes on the hybrid stats page — weapons are referred by wrong names, several unit entries are repeated multiple times and many stats are flat-out wrong. The pages linked above are fixed in accordance to the printed version. 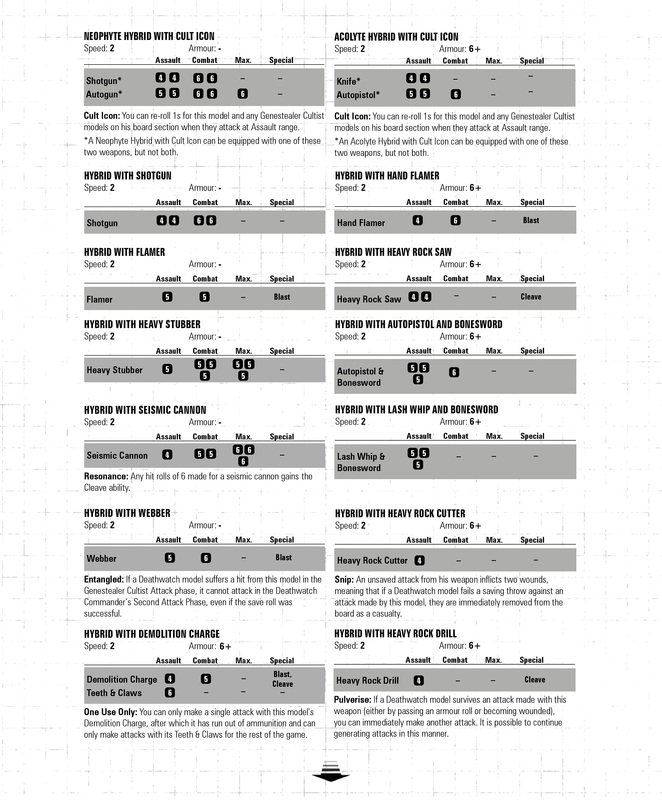 Contrary to the Deathwatch marines or Tempestus Scions, Genestealer Cult units are not supposed to be equal in strength, so I divided them into categories, in which they can be swapped according to the player preference. To put the new fighters into perspective, let's first take another look at units they are made to replace. These warriors are the rank and file of the Genestealer Cult forces. Their favorite habits include dying in droves from a singly lucky explosive bolt, and being such terrible shots it takes at least a dozen to pose any real threat. The alternative version can't attack at maximum range at all, but becomes a real threat in assault. It seems like a good trade-off, but Genestealer Cult has enough close combat fighters as it is. This hybrid got a hold on a weapon with Blast ability. It's not as good for Genestealers as it is for marines, but still has its uses, especially against Tempestus warriors from "Treachery revealed" expansion. Just don't count on it too much; the accuracy of 5+ still leaves a lot to be desired. Flamer is similar to the grenade launcher: this weapon loses its ability to attack at maximum range, but becomes a bit better in assault. Genestealer player has much better assault fighters at his disposal, so if you're in need of a weapon with Blast ability, you'll be better served with a grenade launcher. Here's another weapon with Blast ability. The chances to hit are laughable, but if you do, the target won't be able to attack in the next attack phase. That's all fine and good, but, it's much easier to go the old-fashioned way and take a weapon which will have a real chance to actually kill a target model, or at least wound it, which may still force it to make a combat recovery instead of attacking. A decent ranged weapon, which is prone to hit even in the hands of the basic neophytes. However, it fails in comparison with our next contender. This mining tool makes for a great weapon that fires three shots at maximum range. At that distance it only hits on 6+, but with Cleave ability, every hit results in instant wound. Keep it at maximum range and fire at will. 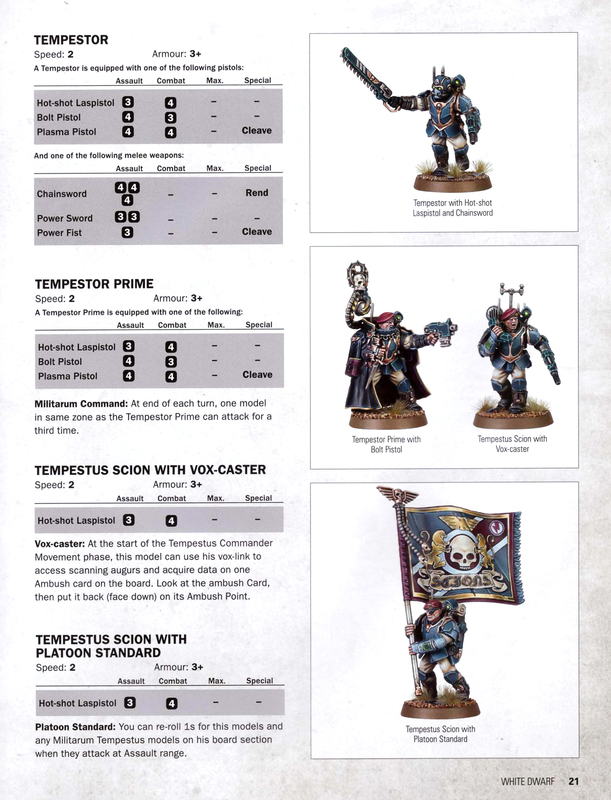 This neophyte shoots like a basic neophyte, but has the same ability as Cassius and Tempestus standard bearer, allowing all friendly models on the same board section to re-roll results of 1 when fighting in assault. It's of great use for the Cult, although it makes the standard bearer an obvious and very squishy target. Still, if the opponent will target him instead of one of your high-threat units, all the better for you. Note that you can only replace one acolyte hybrid with autopistol per ambush card with one of the more specialized versions listed below. Thus, unlike most new models we get in "The genestealer cult arises" these new units are more valuable than the basic acolyte they replace. This is your basic close combat fighter with a decent chance to do some damage in assault. The difficulty is getting him there, seeing as 6+ save is not much better than no save at all. Armed with a miniature flamer, this acolyte becomes less dangerous against single models, but his Blast ability poses a real threat to several enemies on the same tile. Situational, but can end up much better than the basic version, depending on a situation on the board and whether you're fighting against Astartes or Tempestus. Bonesword gives this hybrid a third attack but he now only hits on 5+. This acolyte can theoretically hit up to three times, but he's also much more likely to completely miss, so in the end you'll have to ask yourself — are you feeling lucky? There is definitely some kind of mistake in this unit's description: RAW it gets no benefit for its lash whip, but loses the ranged attack from the autopistol nonetheless. It's unclear what the mistake is, but until it's fixed there is no point in taking this acolyte. This unusual hybrid can throw a one-shot bomb with Cleave and Blast abilities. A chance to hit is not that high, but one lucky 5+ roll can really tilt the odds in your favor if there are several of the Imperium warriors on a single tile. Icon of the Cult has the same abilities in the hands of a little tougher acolyte hybrid. It definitely has its uses if you think you're likely to get into close combat this turn. And it's not that sad to lose it given that the cards of this type are one of the most numerous in the Broodmind deck. This heavily armed hybrid provides you with much needed Cleave attack from a distance, even if it's only from combat range. Unfortunately, a single shot on 5+ will miss more often than not. In addition, it's the only unit except Branatar with a speed of 1, which makes it even harder to use laser-equipped hybrid effectively. Compared to his mining laser-wielding brother, this acolyte can't attack at a distance, but he's twice as dangerous in assault range. Improved move distance of 2 makes getting him there actually possible so if you feel there is a chance of that happening, this is your man for close combat. Compared to the saw, cutter loses both the Cleave ability and the second attack. If you somehow manage to beat the odds and still cause a wound, it will count as two. Sounds not that bad, but the basic knowledge of probability theory shows us that saw has a much greater chance of causing those two wounds (1/4 against 1/6 for the cutter). And that's before you take into account the fact that the alternative for the cutter is just no damage at all, while the saw is likely to cause at least one wound. Finally, saw is much more effective against 2+ saves, while cutter's ability is outright useless against Tempestus Scions or marines that are already wounded. The cutter is only useful against shield-wielding Ectros, but it won't take much effort on the Deathwatch player's part to hide him, so you better take the saw. The drill is another alternative to the saw. Instead of making two attacks you only make one, but make another one every time you successfully hit, so on a 4+. Basically, it's a riskier saw version, which could only make one attack or, theoretically, a lot more. And then you remember that there is no unit in the game with more than two wounds, so all successful attacks after the second are wasted. If only there was a weapon that could just consistently give you those two attacks you need! Oh, wait, there's that saw again. Just take it already, unless the Sorrlock is the one you want to drill through. This is your third chance of getting that icon of the field again. Except in this slot it competes against some really heavy weaponry, so unless you're desperate for some close combat buffs, you better use more basic cards to deploy this guy. 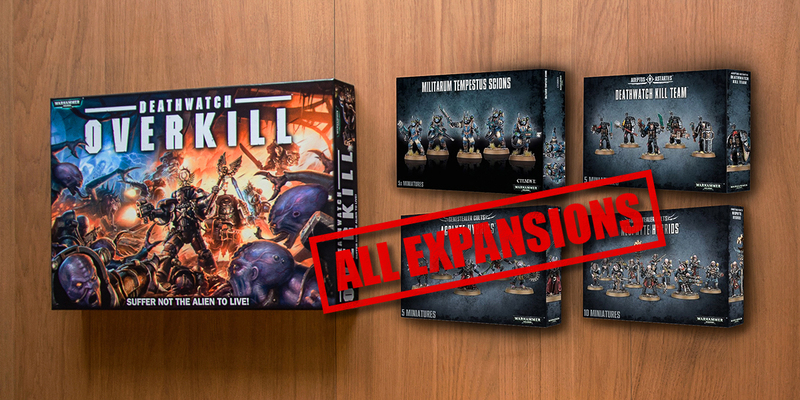 In short: The last expansion opens up a bunch of possibilities for a Genestealer Cult player. A choice between differently armed hybrids greatly influences the tactics he's going to employ which adds another dimension to the game. Some of the new units are generally better than the basis ones, but most just offer alternate profiles to choose from as situation dictates. That's all the new rules Games Workshop provided for Overkill in the last year. They greatly improve the game's replayability and tactical depth, although it's hard to justify the price of all the new models if you don't play Deathwatch or the Genestealer Cult armies in 40k. However, it's still nice of GW to give this kind of support for the game, and if you don't want to go overboard with models you don't need, making proxies is very easy. 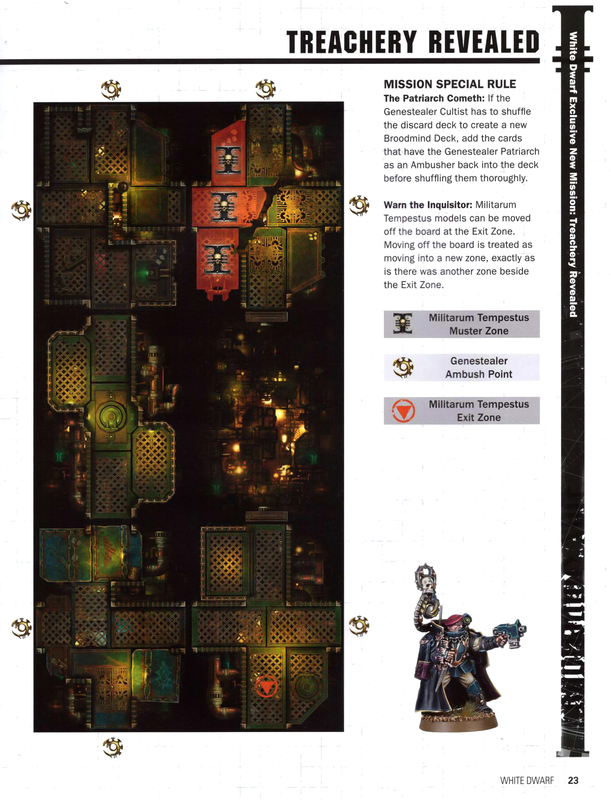 Hopefully, this review showed you a new side of Deathwatch Overkill. Both of the game's armies seem much better suited for the smaller format so I find the game to have a lot of value even after the full-scale 40k releases. As a Guard player I was obviously pleased by the ability to use miniatures from my army in the game. Speaking of it, it's about time to get back to it and get ready for 8th edition.